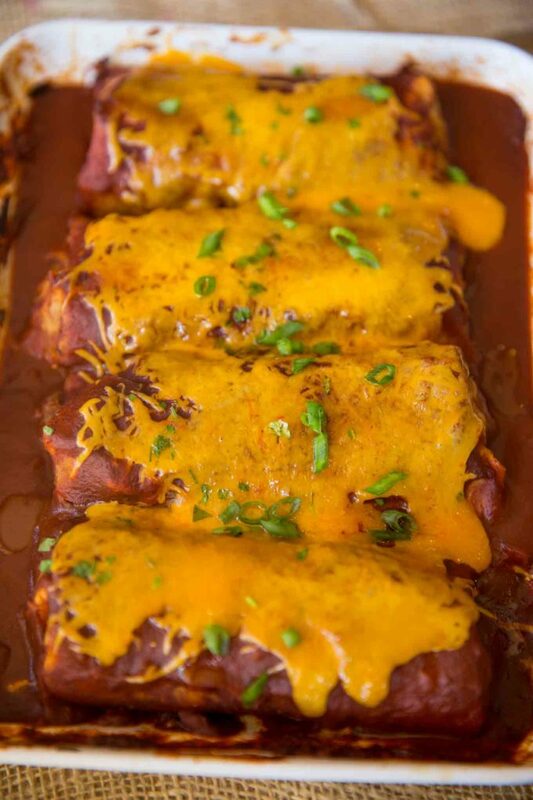 Skinny Chicken Enchiladas filled with chicken, cauliflower rice and onions. Drenched in homemade enchilada sauce and topped with greek yogurt. 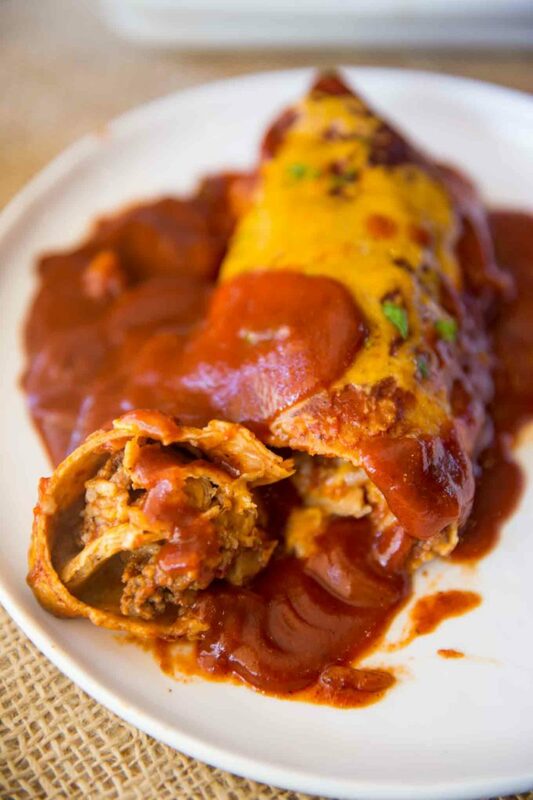 We LOVE and live for Chicken Enchiladas around here, this recipe uses my super famous Enchilada Sauce as the base (I’ve made it a bit healthier for us) and gets thickened up well caramelized veggies. I’m a huge fan of GOOD Mexican food, but find myself in a pretty tough situation when it comes to finding anything good from my local restaurants. Since we aren’t willing to do the Taco Bell Drive through diet (yes that was a thing they marketed for a while!) I have learned I need to make it for myself if I want something delicious and flavorful. The biggest thing I struggle with in enchiladas is making them filling, so you aren’t really just eating a whole bunch of tortilla, chicken and sauce. I toyed with the idea of filling it with bell peppers, but felt like that would taste like a fajita more than an enchilada. Then we went to dinner where my husband ordered a chile relleno and it actually arrived stuffed with rice. I was a bit taken aback but he loved it. So I figured I would use rice. I tried this recipe with brown rice and even with quinoa. I couldn’t get the points down to where I thought I could make this a two enchilada meal if you wanted a heartier dish. Cue the bag of cauliflower rice my husband bought us from Costco. I wanted to try my hand at fried rice made with cauliflower but I’ve been super intimidated by it. So I figured since I am drenching these enchiladas in sauce, how bad could the cauliflower taste right? (I’m sure you all want to feel like you need to go into this recipe feeling how bad could it taste! Hahaha). Well, IT TURNS OUT… it was delicious. Like my husband didn’t even pause when eating level delicious. Maybe cauliflower rice isn’t the worst thing after all. 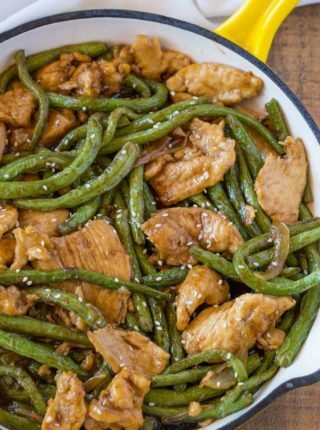 I mostly just add a bunch of soy sauce to my frozen bag I microwave and eat it with my healthier chinese food recipes and pretend I’m eating regular rice (it doesn’t really work, but I love Chinese food enough to make it work!). 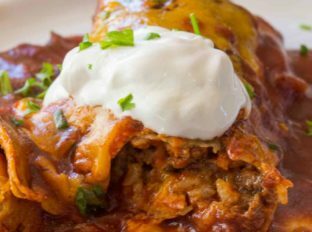 These healthy Skinny Chicken Enchiladas are bulked up with veggies and packed with a lot of flavor. 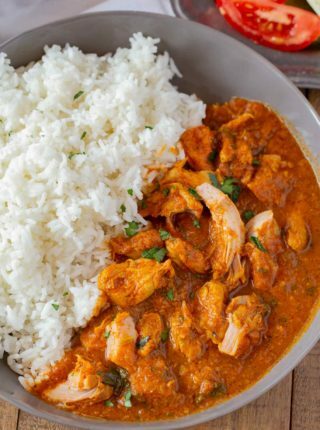 We use tomato sauce, fat free chicken broth and fat free greek yogurt to add a lot of body and flavor to the dish with no points at all! Your smart points are only coming from three places in this recipe, the cheese, the oil and the tortillas. So feel free to stuff the filling in less tortillas. Maybe skip the cheese or use less? I used 50% reduced fat sharp cheddar, maybe try a 75% reduced too. You can’t go wrong with these. I sometimes also use the filling in burritos with a huge pile of Fajita Vegetables and a side of Pico de Gallo Salad for an easy no bake dinner. Add Canola oil to a large skillet with the cauliflower rice, onion, diced green chilis and garlic on medium high heat. Cook for 5-7 minutes, stirring occasionally. Remove the mixture from the pan, add in the chili powder, cumin, salt, oregano, tomato sauce and chicken broth and bring to a boil, whisking well. Add in one tortilla at a time into the sauce, then place into the baking pan. Add in a scoop of chicken and the cauliflower mixture before rolling the tortilla. Pour the remaining sauce over the enchiladas and top with cheese. Bake for 20 minutes covered with foil. Top with yogurt before serving. These look AMAZING!!!! Making soon! 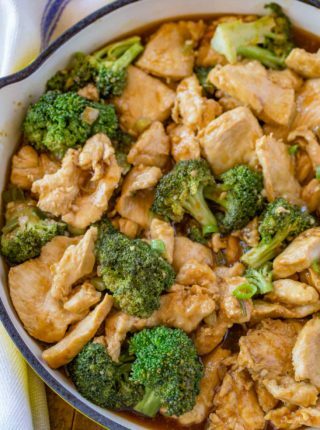 Love the addition of the cauliflower rice! Thanks, Jamielyn! Hope you enjoy it! I love this lightened up version! This is a must-make for sure! Seems to be the perfect weekend lunch! I love all these flavors! 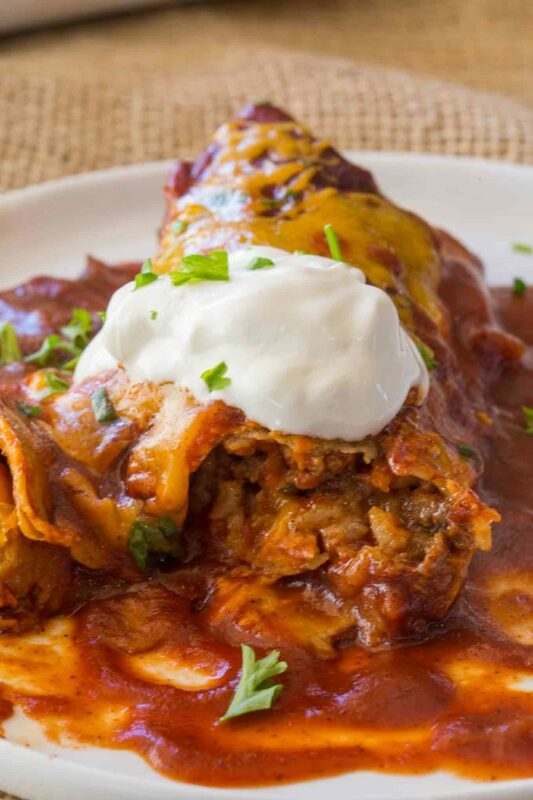 This Skinny chicken enchiladas sounds amazing! I want to dive into my screen! 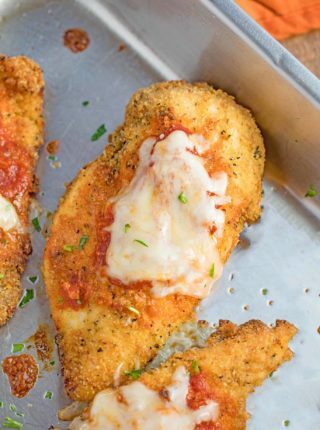 Now I know what I am making for dinner this week! I absolutely love the cauliflower rice in these enchiladas! Everyone cleaned their plates here! Thanks, Anna! My family loved the recipe too! This needs to make an appearance in my house! Looks so delicious!! That recipe’s coming soon! Stay tuned! I’m going to try making with flour tortillas as I don’t have corn tortillas (I live slightly out of town). Crossing my fingers. Just wow! These were amazing and are being added to my rotation of yummy meals! Thank you! I didn’t see the nutritional information on this recipe. Could you let us know what that is? Sorry about that, it’s been added!